Kemitron deliveres a creamy, fine-pored massage foam with the ThermCompact Foamer, a thought through soap foam generator. Because following a steam bath a hamam brush soap massage, a Thai massage or other techniques are often requested, the foam massage makes more and more friends. With the Hammam foamer, masseurs, who did not get a special education for hamam foaming, can be engaged. Amount and intensity of the foam as well as the interval for the next foaming can be adjusted individually. 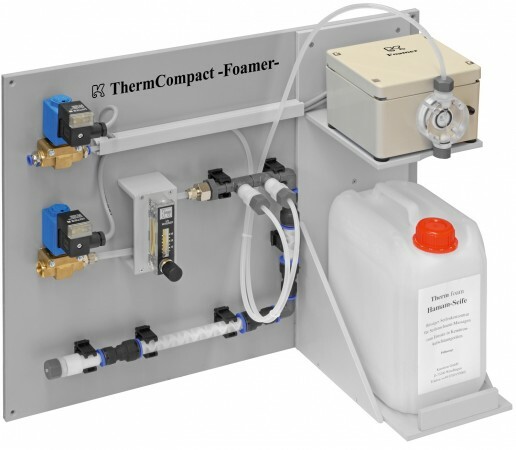 Compressed air support enables the development of very stable foam. Air and water pressure can be set separately. One can rely on the same dosing amount during the entire lifetime of Technico Hamam. System can be rinsed at the touch of a button. Foam pipe can be longer than 5 m, therefore it does not have to be installed next to the masseur. The Hamam, which is also known as “Turkish Bath”or “Moroccan Hamam” is a steam bath that is normally larger than the ones we know in Europe. A traditionally heated “göbek tasi” (literally a “tummy stone”) is placed in the center of the room. A smaller copy of it is in a side room and enables visitors to get a private soap massage. Warmed floors, walls and benches heat the room up to 40 – 42 °C with (possible but not mandatory) 40 – 60 % air humidity of an independent steam source. “Iznik”, traditional Turkish tiles, combined with Carrara marble create an authentic environment, but modern Hamams have all kinds of surfaces.